MAMARONECK, NY – DECEMBER 5, 2018– iMiller Public Relations (iMPR), an award-winning global Public Relations and Marketing company focused on the Communications Infrastructure sector, announces its recognition by the 2018 Bulldog Stars of PR Awards as the Bronze Winner of this year’s Best Industry-Focused Agency. The Communications Infrastructure sector encompasses the technology, products and network connections that enable the transmission of communications throughout the world. Known throughout the industry as a leading fully integrated Public Relations and Marketing firm specifically serving this sector, iMPR’s recognition by the 2018 Bulldog Stars of PR Awards comes among a record-breaking number of entries. 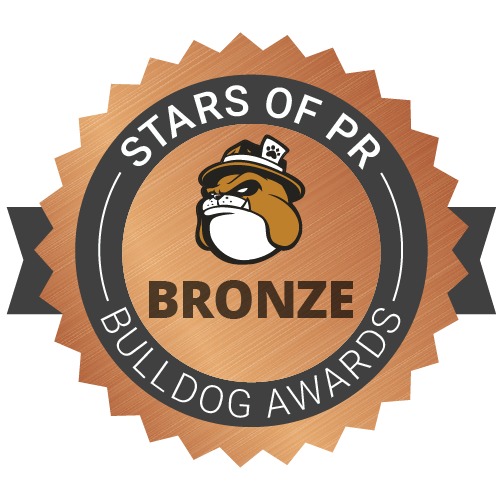 The 2018 Bulldog Stars of PR Awards are designed to recognize extraordinary individual and agency contributions to public relations and communications. Winners are selected across 23 categories by a panel of award-winning journalist judges. All entrants were judged on four attributes including firm positioning, client growth and retention, work environment and results achieved, along with quantitative data and measurable results. “The iMPR team deserves all the accolades as their proven industry expertise, enhanced through a collaborative environment, assures our clients receive the most insightful and applicable strategic guidance to meet the unique needs of their business goals.” adds Ilissa Miller. To learn more about the 2018 Bulldog Stars of PR Awards, please click here. Filled with insights you won’t find anywhere else, the Bulldog Reporter email newsletter – available daily or weekly – brings you compelling and relevant articles, plus timely updates about media moves and agency news, so you can stay on top of your PR game. To find out more about iMiller Public Relations, please visit www.imillerpr.com. iMiller Public Relations (iMPR) is an award-winning, global public relations and marketing firm focused on the Communications Infrastructure sector. iMPR works with innovative start-ups, medium-sized and Fortune 50 companies throughout the world delivering an array of communications service including strategic counsel, brand strategy, content marketing, digital marketing, event planning, media relations, product marketing,social media and more. Combining a dynamic suite of capabilities with unparalleled industry expertise, iMPR delivers game-changing campaigns for telecom and technology infrastructure companies that collectively represent more than $100 billion in annual revenue. We collaborate with clients to elevate brand awareness, drive lead generation, and expand and penetrate new and existing markets. iMPR is the operating arm of NEDAS (formerly the Northeast DAS and Small Cell Association) and manages three online industry blogs: CloudPOST, Data Center POST and TelecomNewsroom. To learn more about iMPR, visit www.imillerpr.com. This entry was posted on December 5, 2018 by Kwan Fai Cheng.